"Some people may experience motion sickness, nausea, disorientation, blurred vision or other discomfort while viewing virtual reality content." So reads the cautionary message that pops up every time you jump into a PlayStation VR game, and it's not just an idle warning: PS VR can potentially throw your body's equilibrium into alarming disarray. Problem is, everybody's tolerance level is different, and it's hard to know what'll make you feel queasy until you're actually struck by those uncomfortable sensations of stomach lurching, light-headedness, or cold sweats. Game developers are hard at work trying to eliminate VR sickness, but until they discover what makes a VR experience entirely nausea-proof, there's a chance that some games will have you ripping off the headset and going for a restorative lie-down to soothe your stomach or dispel dizziness. Again, there's no definitive way to know beforehand if you'll be prone to motion sickness in any given PS VR game, but members of our staff have experienced some pretty pukish moments after running the VR gauntlet. Resistance varies from person to person, and your brain can build up a tolerance to VR trickery over time - but as of right now, these are the PS VR games that inadvertently make us some of us sick. Driveclub VR - "It made everyone feel sick"
The above video says it all: we couldn't review Driveclub VR because it physically incapacitated our would-be reviewers. You'd think that driving a car in first-person VR would come naturally, considering it's such a common activity, but something about speeding down the twists and turns of these digital racetracks is enough to make you lose your lunch (especially if you're in a convertible or F1 car). Even with all the options for adjusting your view, Driveclub VR is borderline unplayable for the majority of our staff - which is odd, considering how the demo didn't have anywhere near the same sickness-inducing effect. Resident Evil 7 - "I had to take the headset off after five minutes"
At E3 this year, many of my colleagues had a chance to check out Resident Evil 7 in VR, and I'd say a little over half of them felt violently ill after spending only a few minutes with it. I'd played a few VR games at PAX East and had no problems, so I walked into the demo hopeful that my experience would fare better. I also wanted to hedge my bets, so I let the rep know that if I started to feel sick, I'd raise my hand and have them pull me out to play the regular version instead. RIGS: Mechanized Combat League - "I struggle to make it through a single match"
Arena shooters have always been near and dear to my heart, having grown up on the likes of Unreal Tournament and Quake 3 Arena. Any FPS that emphasizes quick movements, pinpoint aim, and twitch reflexes at any given moment is good in my book. But that book was written in a time before VR, because when you incorporate classic FPS controls - left stick to move, right stick to aim - into a PS VR game, I feel like I need to bail within minutes. 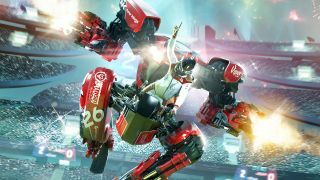 RIGS is an arena shooter at heart, where players suit up in giant mechs to blast one another in sports-like stadiums. And while you learn to master a multiplayer shooter over the course of many matches, I have a hard time getting through even one without wanting to activate the ejection seat. Here They Lie: "This game made me sick and scared, and - ironically - I needed to lie down after a few hours' play"
I'm pretty good with VR games, having blasted, Bataranged, and building-blocked my way through most of the launch line-up. I'm also no scaredy cat either when it comes to horror - I finished P.T. without much fuss, sat through the Kitchen demo with the requisite amount of screaming, and I list Silent Hill 2 among my favourite games of all time. And yet... Here They Lie left a bitter taste in my mouth. Perhaps that was a little bit of vomit, which I could feel rising as I passed through the game's nightmarish dreamscape. Scavengers Odyssey (VR Worlds): "It was like it plugged directly into my sickness reflex"
The weekend after we got our PlayStation VR in for review, I spent probably about 24 hours in the headset, making me at least feel like part of the Matrix even if I was just sat on my sofa in Batman pyjamas trying not to hit cups of tea on my coffee table. 97% of my experiences were brilliantly positive. The PS VR is the most comfortable out of all of the big three headsets, and the majority of my 3D jaunts felt like I'd genuinely arrived in the future. That was until I tried VR World's Scavengers Odyssey and it was like it plugged directly into my sickness reflex. Do not pass go, do not collect keeping your lunch. Resident Evil 7 - "It made me so nauseous, so sweaty and gross, I literally ran away from the demo station"
Full disclosure: I get motion sick fairly easy in the modern age of gaming. After 30 years of being perfectly okay playing every type of game, the age of widespread 60fps 3D gaming has become dangerous for me. Tomb Raider: Definitive Edition, Star Ocean 5, Doom 2016; if it's 60fps but either isn't optimized for that speed or doesn't allow field of view adjustments, I'm in trouble. The discomfort I experience from frame rate issues, however, is nothing compared to what I experienced playing the first Resident Evil 7 PS VR demo.